I really like it a lot, it even looks a liiiiiiiiitle bit like something one of my favourite tanglers, Margaret Bremner, could have done. Just a little bit. My unconscience played me a neat trick here because only a few hours before I first put pen to paper on this tile I started watching Avatar – The last Airbender (the cartoon series) and the first part is all about waterbending (that is controlling the element of water so it can be manipulated at the Avatar’s / waterbender’s will). So… I guess I might have to do a tile for earth, wind and fire, too, as the series progresses.. We’ll see! It’s a lovely series and it would be cool to have a little element set for myself. The downside is that the tile literally took half the day to tangle and colour in.. Hope to get faster here soon! For this tile I sued some watercolour base (Schmincke Horadam) and then my trusty Faber-Castell Polychromos. It somehow felt right to use them here and not my new love, the Caran d’Ache Luminance (there’s always next time!). Posted on 17. June 2018 17. 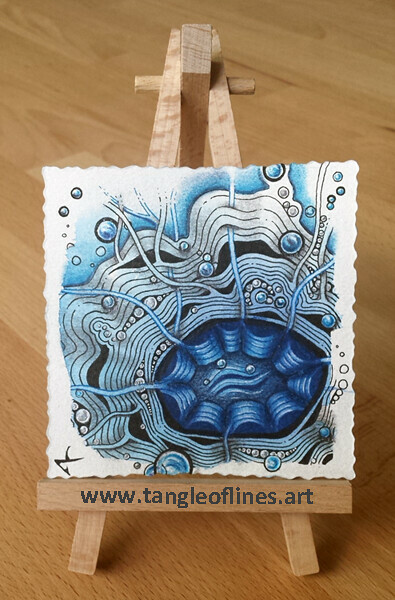 June 2018 by Yvonne LiPosted in Zentangle-Inspired Art (ZIA)Tagged coloured pencil, watercolour, Zentangle-inspired-Art. Tangling in Berlin, Germany. Love Zentangle and Zentangle-inspired art, drawing ATCs, photography, the game of Go (囲碁), Japan, Japanese and Japanese culture, and way too many other things for the amount of free time that I have. You can find me in the Zentangle Mosaic app as YvonneLi. The works on this blog are - unless otherwise stated - licensed under a Creative Commons Attribution-NonCommercial-NoDerivs 3.0 Unported License.